You’ve decided it’s time to take the plunge and have booked a stand at your first tradeshow. Now what? Booking your stand was the easy bit, but you can feel a sense of building panic as you realise you’ve no idea how you’re going to organise your first tradeshow. Don’t panic. Here’s my breakdown of how you can ace your first tradeshow. You’ve probably spent a reasonable amount of money on booking your stand, so planning your presence is the sensible thing to do. Putting in effort at the beginning will pay off dividends during the tradeshow and afterwards. Here are my tips on how to plan effectively. Set aside some dedicated time. Exhibiting at tradeshows can be expensive. That’s why it’s vital that you put aside some time to plan your presence. You may decide to do it all in one go, or you might have an initial planning session to think about all the things you need to do. However you decide to approach it, I guarantee that having a plan will make the prospect less scary and seem more manageable. You won’t believe how many businesses arrive at a tradeshow not knowing what they want to achieve. That’s a sure fire way to failure. Knowing what you want to achieve is key to everything you plan for, at and after the show. Your objectives don’t have to be lofty either. They could be as simple as: add 30 people to our email list, achieve 60 entries for our prize draw. If you put a number on it, after the show you’ll know how successful you were. Trust me, you will need “stuff” for a tradeshow. I have not organised one tradeshow where there hasn’t been a list of items needed, no matter how small the stand. Make a list of all the things you’ll need, from brochures to branding; business cards to prizes; pens to how you’ll get everything there. The more organised you are now, the easier it will be on the day. Whilst the day of the tradeshow is your BIG deadline, there will be other, smaller deadlines along the way. These are your key milestones. Figuring out what they are and when they happen will help you prioritise what you do in preparation for the tradeshow. It will also help you chunk up the work, so it won’t seem like one, big thing you have to do. I’m a big fan of getting things in a calendar. It helps me organise myself and makes sure I put aside time to do things that are important for my business. So, once you have a list of things you need and the dates you need them by, work backwards to figure out what you need to do, by when, to meet those mini deadlines. Now you have a plan, it’s time to get busy organising your first tradeshow. Because you planned your time, getting things done won’t be a problem. Here are my top four things to help you get the most out of your plan. There are certain things that you’ll need that will take longer to finish than others. For example, if you’re planning a new brochure, you need to give yourself plenty of time to make sure it’s ready for the tradeshow. So start these things earlier. Remember the key milestones from the section above? Make sure you stick to them to have everything you need. All tradeshow organisers will send you a floorplan ahead of time. Take a look at where your stand is and plan what it will look like on the day. Where will you put your pull-up banner? If there’s a table, how will you arrange things on it for maximum impact? Having a vision before the day will help you set up more quickly. Of course, you’ll make tweaks on the day. There’s no substitute for seeing your space, but having an idea upfront will make things easier for you. I can’t tell you enough how important this is. Knowing what you’re going to send out as a follow up before you even get to the tradeshow sets you up to contact your leads quickly afterwards. Knowing what your objectives are, you’ll be able to easily work out the follow up you want to send. You will, of course, have unplanned questions to answer from visitors to your stand. Having the majority of your follow up planned in advance will also help you get to the more unique follow ups more quickly. The organisers will regularly send you updates about plans for the tradeshow. Make sure you read these thoroughly. In addition to this, keep in touch with the organisers. If they haven’t told you, as for the hashtag they’ll be using. This will help with your promotion. Make sure you’re getting all the information you need from them. Offer to help spread the word. Doing all of this will keep you top of mind with them, and if there are any extra promotional opportunities, they will be in touch with you. You’ve done all your prep work and you know you’re going to have a good show. To make it great, do these five things. There’s nothing more stressful than trying to finish setting up your stand when the doors are opening and people start to arrive. Give yourself a break and arrive at the venue early. If you’re allowed, set up the night before. If you have to set up on the day, get there at least an hour ahead of the doors opening. Having the breathing space to set up your stand will ensure you have a relaxed start to the day. I can’t tell you the number of times I’ve managed a tradeshow stand and had people complain that they’re uncomfortable in what they’re wearing. The biggest complaint is how much their feet hurt. You’re going to be on your feet the majority of the day. This is not the time to try those new trousers/dress/shoes you’ve been waiting to wear. Dress comfortably and that’s one less thing you have to worry about throughout the day. If you have a team working on the stand, briefing them before the show gets started is really important. This is where you remind them of your goals, their roles and responsibilities and logistics, such as where the loos are, when they have their breaks and so on. Knowing all this information will help your team to relax and get ready for the task at hand. I’ve been to a LOT of tradeshows, both as an exhibitor and an attendee. The thing that never ceases to amaze is watching stand staff read their own brochures! Don’t they know what their own company does or sells? If you’re having new brochures created for the show, make sure your team gets to see them before the show. They need to know the content to be able to talk to visitors. Don’t make them read it at the show. Smiling is infectious. There’s no way of getting round it. If someone smiles at you, you’re going to smile back. So, wearing a big smile will make you look more approachable and entice people to visit your stand. It’s really as simple as that. The last visitor has left the venue, but your job isn’t done yet. Here are four things you need to do once the tradeshow is finished. What did your team think? If you have a team working with you at the show, take 10 minutes before they leave to get their feedback. Having a debrief with them is important. They talked to lots of people and have ideas of what worked and what didn’t. You need this information to make your next show even better. So, no matter how many groans you get (because people will want to leave as soon as they can), make sure you do this. If you planned and set up your follow up ahead of time, this will be a breeze for you. You need to follow up with leads as quickly as possible. Memories fade and people who visited your stand won’t remember you a week later. So, get to this as quickly on your return as you can. And remember I said you’d have questions you weren’t expecting? Yes, well, now you have time to answer those thoroughly. If you debriefed with your team, now’s the time to get down on paper what they said. If it was just you on your stand, think back and make a list of everything that worked and didn’t work. Doing this is really going to help you the next time round. It will save you lots of time on thinking how you should do things, and even help save time doing them. Remember all the way at the beginning of this post I said you should write down some objectives? Now’s the time to go back over them and tick off what you achieved. This is key – it’s going to tell you how successful the show was for your business, and whether you should do it again. Going to your first tradeshow is an exciting prospect. Make the most of your experience by planning ahead and come away with a big smile on your face and lots of leads for potential new customers. 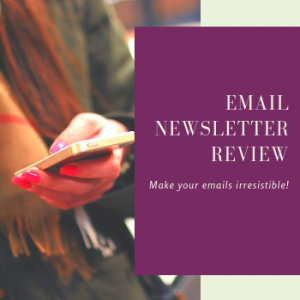 Want to get my weekly marketing tips straight to your mailbox? Sign up here. Great article Minal, thanks so much. I am doing a couple of events in June so this is very timely. Thanks, Kathy. Glad you found it useful. If you need a sounding board for your events, let me know.